Mineral Specimen No. 70811: Elbaite var. Rubellite Tourmaline (with internal gem nodule) for sale from Himalaya Mine, Mesa Grande District, San Diego County, California. Elbaite var. Rubellite Tourmaline (with internal gem nodule) for sale from Himalaya Mine, Mesa Grande District, San Diego County, California. Mineral Species: Elbaite var. Rubellite Tourmaline (with internal gem nodule). Location of mineral deposit: Himalaya Mine, Mesa Grande District, San Diego County, California. 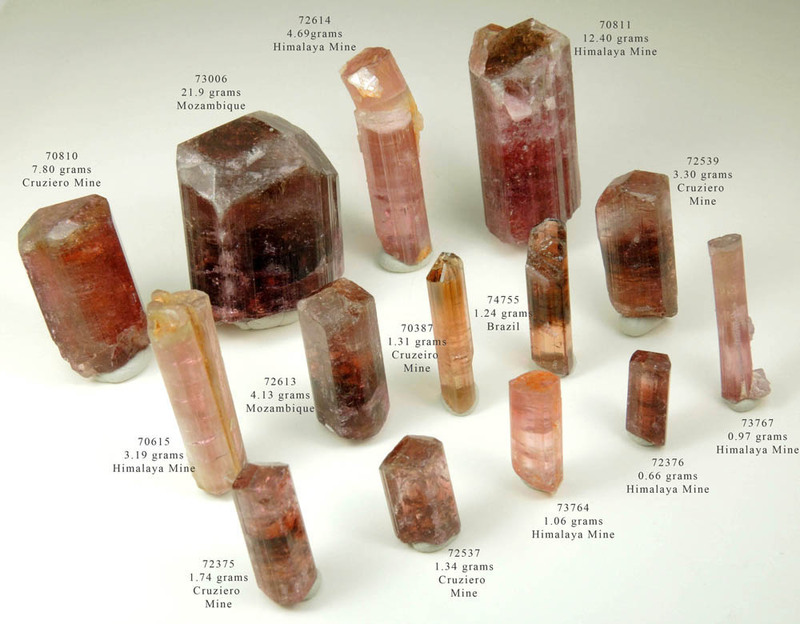 Description: Lustrous transparent pink rubellite tourmaline crystal, the pink gem variety of elbaite tourmaline, with complex termination composed of parallel crystal faces from multiple crystals that merged into one. The bottom end shows a 4 mm gem rubellite nodule. The crystal faces are clean and in good condition, the outer edges show minor wear. Weight: 12.40 grams. Overall size of mineral specimen: 31x14x13 mm.